On Saturday, Matt and I rode our bikes to our dear friends' wedding. 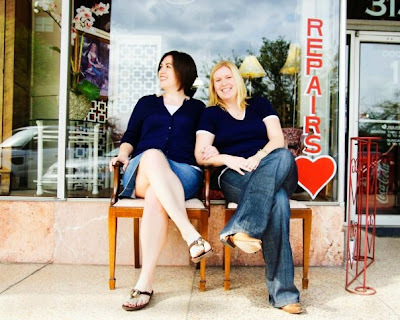 Anne and Gena, proclaimed and celebrated their love at an art gallery in our neighborhood. The space was perfect for the nighttime soiree. Their self-written ceremony was immensely touching, and I very much appreciated that I could hear every word of it! The gallery has two distinct rooms. One was used for the bar and the jazz band, while the other was used for the food (included the tops of cupcakes--which is the best part, in my opinion!). For a guest book, they had the girlfriend of Anne's brother be in charge of snapping guests' photos, printing them out on the Pogo Printer from Polaroid, and then sticking them in the guest book next to the guests' letters. They found their professional photographer on craigslist by posting an ad in search of someone who would be willing to build his/her portfolio by inexpensively photographing their wedding. They found Tracy, who was extremely talented and sweet. She even gave them a framed engagement photo as a present. I tend to be shy at events with lots of unfamiliar people, but I tried to push myself to interact with new people. I talked about vintage clothing with the gallery owner, met a fire fighter from my local station (I plan to bring cookies to him on Thursday), made friends with the lady running the open bar, chatted with the photographer, and reconnected with someone I haven't talked to in a while. On Sunday, Matt and I picked up breakfast from Baby Barnaby's and had a picnic on the Menil lawn. Then I kicked his booty in a little bocce ball. Hey, I live in H-town, too! But your wedding wasn't in H-town, right? @ Girl in Transition: Hey! We got married in Colorado because we were living in Denver at the time. We moved to H-town after our wedding. Hooray for Houston! Tooooootally random, I went to college with Gena and Anne! I've been considering using the Pogo printer for our guest book and I'm glad to hear that it worked out well for them. You and your hubby are so cute on your bikes :)-- I love your puppy dog haha. i *love* that you rode your bikes! I *love* that you rode your bike too. In a dress. You are too hip and cool for words Sara Cotner. I love the site and am getting great ideas for my wedding. I was so suprised to see Gena and Anne's wedding on the site- I went to college with them! It was a suprising treat while I was at work!